A turkey called Clyde, cyber makeovers for Melbourne-Boston, and cocktails with a French horn player – they’re our c-words for the week: can you compete? It’s not unusual for American leaders to flex their power muscles by pardoning a turkey or two in the lead up to Thanksgiving. What caught our eye was a turkey named Clyde who was pardoned this week by the Governor of Alabama as part of the state’s thanksgiving tradition to pardon a turkey named Clyde. If you want to hear more about pardoned turkeys starting with C, then join us on Thursday, 27 November for ‘A Melbourne Thanksgiving’ cocktail celebration with other friends of Melbourne/Boston. Onto cyberspace, and we’ve been coding (well actually we’ve left the coding to the professionals at ManageWeb, credit where credit’s due) the new website for Melbourne Boston Sister Cities Association. Take a moment to catch up on all the connections between our two great cities. And cocktails with a french horn player you ask. We helped host the presentation of the 2014 Hugh Rogers Fellowships on behalf of the Melbourne Boston Sister Cities Association during Melbourne Knowledge Week. Among the five inspiring recipients of Hugh Rogers Fellowships, including a bioinformatician, two science teachers and a researcher building a low-cost, electricity-free oxygen concentrator, there was a french horn player. Susan de Weger, who visited the New England Conservatory of Music in November, entertained the guests with a number of pieces on her French horn. More c-words to follow in the coming weeks: curating content at the #ObesitySummit, connecting with other PRIA Fellows at the national conference, celebrating colleagues, chums & clan in the lead up to Christmas & controlled consumption of champagne & canapés! PS. Here’s our favourite turkey pardoning scene from the West Wing – thanks CJ! When you plan your next event, don’t forget to include a Twitter hashtag to ensure the conversation continues long after the last guest has departed. We have been in event planning mode for the past few months to celebrate our client veski’s significant milestone – 10 years of inspiring innovation – and make it as memorable and as momentous as possible. Last week was chock-a-block full of events, media and celebrations, culminating in a gala dinner over the weekend on the evening of the actual anniversary. More to come on these events in upcoming blog posts! It has involved a plethora of plans, run sheets, speech notes, venue theming, collateral writing and design and to top it all off ensuring there’s a Twitter hashtag for audience participation and to capture the conversation. Among the events to celebrate the milestone was an industry symposium: Smart Australia 2030 at Federation Square. When you bring an engaged audience and leading minds together to talk about the future of the country you’re going to get lots of involvement. So, if you don’t have the right hashtag you’re going to miss out on all the valuable comments and ideas from the audience. When you listen to your audience you get instant and valuable feedback. The next time you’re planning an event, don’t forget to include social media as part of your engagement strategy—what’s your hashtag, how are you going to manage the comments during the events and how will you ensure all participates by know how to follow the conversation. This week, we helped our client veski welcome two new veski innovation fellows back to Victoria; Dr Mark Dawson formerly of the University of Cambridge in the UK and Professor Kenneth Crozier from Harvard University in the USA were welcomed back by the Minister for Health, the Hon David Davis MLC. As a result of their return, new optical technologies that could allow digital cameras to ‘see’ more than colour and a novel approach to treating acute myeloid leukaemia (AML) will be developed in Victoria. Both Dr Dawson and Professor Crozier are working on extremely c-ritical and c-utting-edge research projects and over the past few weeks, the c word crew has been working with veski to profile their return. Dr Mark Dawson has returned to work at the Peter MacCallum Cancer Centre where he is leading a group of researchers in the newly established Cancer Epigenetics Laboratory while Professor Kenneth Crozier will return in July 2014 to join the University of Melbourne’s School of Physics and Department of Electrical and Electronic Engineering. Dr Mark Dawson is one of Australia’s most promising and talented clinician-researchers and is working towards an effective treatment for AML. He aims to translate important basic science discoveries made in the laboratory into innovative and targeted cancer therapies, which will build on his previous collaborations with international pharmaceutical companies. Professor Kenneth Crozier will return from Harvard University in July 2014 to continue the development of ground-breaking optical technologies with a range of potential applications from improved digital cameras to systems for imaging biological samples. With 2014 marking veski’s 10 year anniversary, veski chief executive officer Ms Julia L Page said the board was excited to welcome the 19th and 20th innovation fellows to Victoria and would support them in joining the science and innovation communities. “In veski’s first 10 years, we have been able to attract 20 of the world’s most outstanding researchers and scientists to continue their work in Victoria, and Dr Dawson and Professor Crozier join an impressive group which includes the President-elect of the Australian Academy of Science, Professor Andrew Holmes AM,” Ms Page said. At the event, the call for applications for the 2014 round of veski innovation fellowships was also opened. Do you know (or are you) an outstanding researcher or scientist looking to move your research to Victoria? 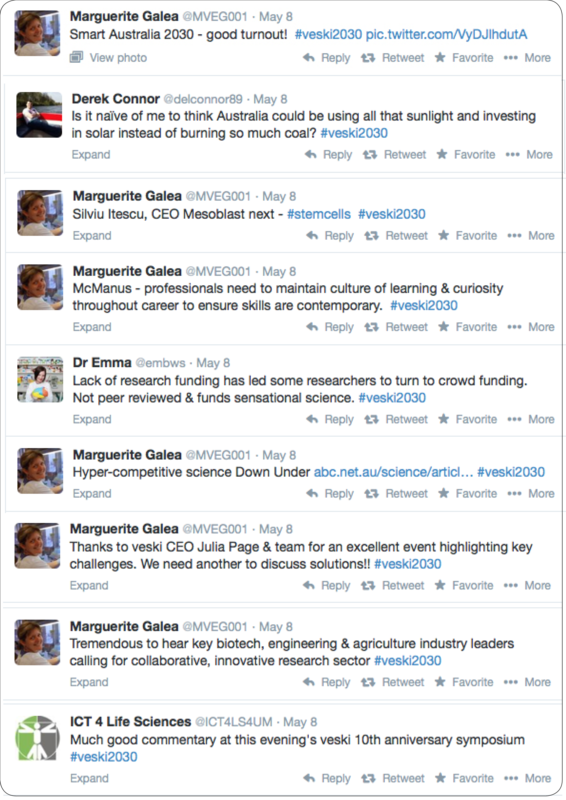 If so, check out the veski innovation fellowships. This week’s c-word has been courting. 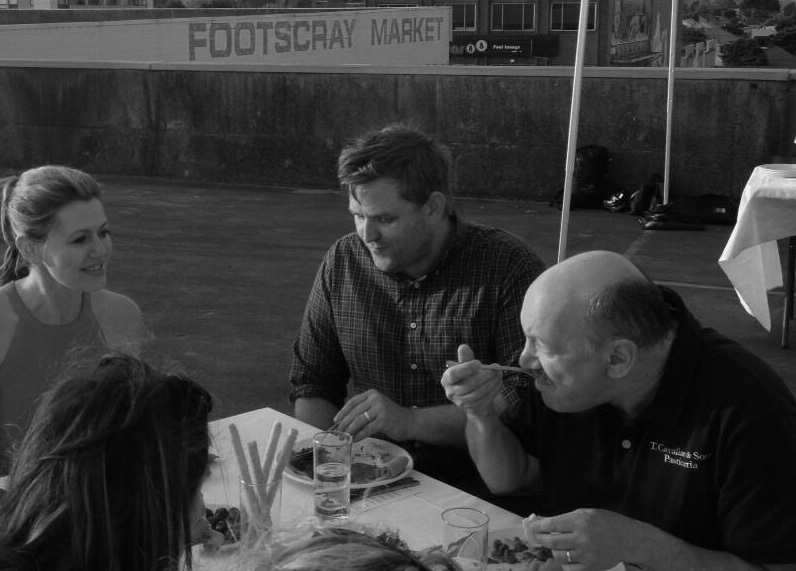 The courting started on, er, hump day, of course, when we chaperoned Melbourne’s media darlings on a blind date with #YourFootscray ambassadors on the Footscray Market roof. Was the serenade at sunset a success? If you measure success by the level of impassioned conversation, then yes. As guests noshed on the Ethiopian banquet and crispy cannoli, the ambassadors expressed their love for Footscray for all to hear. the c word caught the train home, warmed by the inner glow that comes from connecting complementary strangers – and of letting people in on a secret you know they’ll always love you for. The #YourFootscray ambassadors, the crazy cads that they are, were just warming up. They’ll be spruiking their wares again when they provide winners of an online ‘win-a-date’ competition with opportunities to fall in love with their favourite suburb. Think a cannoli-making lesson with Tony; an Ethiopian coffee ceremony with Abdul and Rozenn; a Vietnamese brew with Kevin at his café; tacos and craft beer with The Reverence Hoteliers; and a lesson in spotting the freshest catch with fishmongers, Paul & John. Did your heart just skip a beat, or did you have a little too much caffeine to get you through Friday afternoon? Whichever the case, the competition is easy to enter: first, voters select a date (cannoli, tacos, fresh fish, Ethiopian coffee or Vietnamese coffee), then they visit www.facebook.com/yourfootscray, or www.twitter.com/yourfootscray and explain in 20 words OR LESS why they want to win. To be eligible, entries must be lodged by 11:59pm on Wednesday, 9 October, 2013. Move over Casanova because we’re also concocting a rendez-vous of the three-way speed date kind for another client. Watch this space for a full update. Our final Spring Fling for this week has been to announce that Australians are returning to the polls again next month, this time to vote for the most popular bird in the land. The poll – BirdLife Australia’s way of encouraging us to ‘Meet the Neighbours’ (think: chick next door) during peak mating season – will run alongside events in cities and towns across the country. The winning bird will get its own cover on the December edition of “Australian Birdlife” magazine, while one lucky human voter will win a holiday at the beautiful O’Reilly’s Rainforest Retreat in the Brisbane Hinterlands. Vote for your favourite Australian bird at www.AustraliasFavouriteBird.org.au and look out for more plucky stories during National Bird Week 2013 which runs from 19 to 25 October. On Tuesday the c word launched ‘Your Footscray’ on the roof of the Footscray Market with nine local business ambassadors and supporters including Regional Rail Link, City of Maribyrnong and the Western Bulldogs. The social marketing campaign will run over the next six months on www.footscraylife.com.au with weekly interviews with each of the ambassadors on a range of topics. The aim is to raise the profile of Footscray through the eyes of our nine ambassadors and we think that by the end of six months you’ll see what they see! We’ll also be tweeting at @YourFootscray and Facebooking at facebook.com/yourfootscray – lots of interesting content to come! You can also book a spot on the Footscray Food Tours and along the way you’ll meet many of these ambassadors as well as a lot of other people living and working in Footscray. A few weeks ago, the c word took Ross and John from 3AW Breakfast on a Footscray Food Tour with Melbourne foodie Allan Campion. This week we have been in Footscray photographing and interviewing local retailers for an exciting new campaign we’ll be launching next month. Watch this space! The Footscray Food Tours are run on the first Saturday of every month and promote the variety of fresh produce, flavours and characters in Footscray. Starting with a hot jam donut and ending with a traditional shared Ethiopian lunch, you’ll discover all that Footscray has to offer. The tour is supported by our client Regional Rail Link and takes in the established precincts of Greek, Indian and Vietnamese restaurants, as well as the newly arrived cuisines of migrants from Eritrea, Ethiopia and Somalia. After working up an appetite visiting the butchers, fishmongers and delis of the Footscray Market you head out onto the streets of Footscray to sample treats from the Indian food stores, Italian bakeries and Asian grocers. Make sure you have an empty stomach for the tour, because there’s plenty of food to sample from Melbourne’s best cannoli, to sugar cane, and kumquat juice. The tours start at 11.30am on Irving Street on the forecourt of Footscray Railway Station and conclude at 2.30pm following a traditional shared lunch at Konjo Ethiopian Restaurant. Tickets cost $110 per person and include the guided tour, information about the local area and Footscray’s food history, as well as tastings, samples, coffee and lunch. Visit the Footscray food tours website to book your place.